Babbitt temperatures in pivoted shoe bearings can be significantly reduced by offsetting the pad pivots in the direction of rotation. However, reverse rotation can occur in certain types of machinery under temporary or adverse conditions. The offset is then in the wrong direction and it becomes important to know if the bearing can withstand the reverse rotation operating conditions without damage. This paper compares pad temperature data from tests of a 152.4-mm, 60 percent offset bearing in forward and reverse rotation. The data indicate that the offset pivot bearing can run in reverse without damage for the operating conditions tested. Reverse rotation pad temperatures are hotter. Discussions towards the end of the paper address assessment of the data. A number of technical papers present steady-state results from experimental work on center pivot journal bearings. The offset pivot journal bearing is not as well documented, although there is sufficient information and experience to show that pad temperatures are significantly reduced by offsetting the pad pivots in the direction of rotation (Dmochowski, et al. (1); Bouchoule, et al. (2); Simmons and Lawrence (3); DeCamillo and Brockwell (4); Brockwell, et al. (5); Nicholas (6)). Unfortunately, there are conditions that can cause reverse rotation in certain types of machinery and applications. Some are expected and are only temporary. Others can occur under adverse or unusual conditions such as backwash through a pump from a check valve failure. When designing for an offset pivot application, reverse rotation is a concern because the offset is then in the wrong direction. As pad temperatures improve, going from a center to an offset pivot design, it is logical that the reverse rotation will run worse, and so it becomes important to assess if the offset design can withstand the reverse rotation operating conditions without damage. This is the fifth in a series of papers that present results from an extensive study of parameters that affect the performance of pivoted shoe journal bearings. The first paper compares test results of direct lube leading edge groove (LEG) lubrication to a conventional, flooded design (Dmochowski, et al. (1)). Subsequent papers report on the effects of oil flow, pivot offset, load orientation, and oil viscosity grade (DeCamillo and Brockwell (4), Brockwell, et al. (5), (7)). The purpose of this paper is to provide information from pivot shoe journal bearing tests comparing pad temperatures of a 60 percent offset bearing in forward and reverse rotation. A full description of the test rig is given in Brockwell, et al. (5). Briefly, it consists of a 152.4-mm diameter shaft, driven by a 112-kW variable-speed DC electric motor. 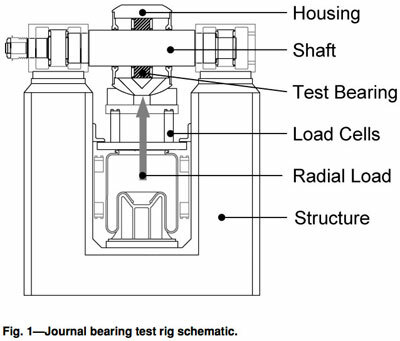 The rig is capable of applying radial loads to a test journal bearing, to a maximum shaft speed of just over 16,000 rpm. A slotted optical switch in conjunction with a shaft-mounted disk with a number of drilled holes measures shaft speed. A 25-kN capacity pneumatic cylinder generates the radial loads, measured by three load cells located between the cylinder and test bearing (Fig. 1). Oil flow rate to the test bearing is measured by a turbine-type flow meter. Feed oil inlet temperature to the test bearing is controlled by a water oil heat exchanger to within ±1◦C. Thermocouples monitor the oil inlet and outlet temperatures. Measurement uncertainties are listed in Table 1. The test bearing has a nominal diameter of 152.4 mm and a pad axial length of 66.7 mm. The assembled bearing diametral clearance is 0.23 mm, and the nominal preload is 0.25. The pads have a 60-degree angle and are steel backed with a babbitt surface. Pivots are rolling contact with radii of curvature in the circumferential and axial directions. The circumferential curvature permits each pad to change its tilt to accommodate changing operating conditions. The axial curvature allows the pads to align with the shaft. The pad pivots are offset 60 percent of the pad angle in the direction of shaft rotation (Fig. 2). Lubricant is fed to the pads through five radial holes that direct oil from an annulus on the outer diameter of the bearing to the spaces between the pads. Oil exits through the clearance between the shaft and labyrinth seals on either side of the bearing, such that the bearing cavity is flooded and at a slight positive pressure (Fig. 3). The test bearing pads are instrumented with an array of 45 type-T thermocouples, with the tip of each thermocouple located 0.5 mm below the babbitt surface. The loaded pad is more heavily instrumented along the centerline and includes additional thermocouples along the edges of the pads (Fig. 4). Data in this paper are all based on a load-on-pad (LOP) bearing orientation where the applied load is directed towards one pad. The data covers a shaft speed range of 3600 to 9042 rpm, corresponding to journal surface speeds between 29 and 72 m·s−1. Applied bearing loads were 3.5, 14.0, and 22.2 kN. Associated projected unit loads are 0.35, 1.4, and 2.2 MPa, respectively. Oil flows were set for each operating condition (Table 2). The lubricant used in this series of tests was an ISO VG 32 turbine oil, with a measured viscosity of 32.76 centistokes at 40◦C, and 5.41 centistokes at 100◦C. The lubricant’s density and specific heat are 30◦API and 0.14 W/m · K, from the oil manufacturer’s published data. All tests were performed with an oil supply temperature of 49◦C. Tests were performed first with the bearing installed in the proper direction of rotation where the pivot offset is at a location 60 percent of the pad angle in the direction of rotation. Data were recorded for each load and speed combination after steady-state operating conditions were attained. The test bearing was then removed and installed for reverse rotation and a second set of data recorded. In reverse rotation, the pivot offset is at a location 40 percent of the pad angle in the direction of rotation. Pad temperature profiles are obtained by plotting the centerline thermocouple temperatures against the relative angular position of the detectors in the bearing. The loaded pad pivot is at an angular position of 270 degrees, bottom dead center. Figures 5 and 7 are pad temperature profiles for the bearing running in the correct, forward direction of rotation. Figures 6 and 8 are the corresponding pad temperature profiles for the reverse direction of rotation. Some common trends for both forward and reverse rotation can be ascertained from the figures. The temperatures of every pad increase in the direction of rotation, and the temperature levels of every pad increase with speed. An increase in load effects an increase mostly on the loaded pads, accompanied by a small decrease in upper pad temperatures. It is noted that the loaded pad temperatures increase in the direction of rotation, to a maximum before falling off to a lower level towards the trailing edge. It is also noted that reverse rotation maximum temperatures are much hotter, reaching 136◦C compared to 109◦C for forward rotation at the most extreme conditions tested (Fig. 5 vs. Fig. 6). Figure 9 compares the maximum measured temperatures for forward and reverse rotation for the various operating conditions tested. Reverse rotation maximum measured temperatures ran 1 to 27◦C hotter, depending on the operating condition. Additional information is obtained from the data by studying pad isotherms. These are generated by curve fitting data from the heavy array of thermocouples in the loaded pad surface. Figure 10 is an isometric view of the loaded pad isotherm for 62 m ·s−1, 2.2 MPa, in reverse rotation, and Fig. 11 is the corresponding plan view (looking at the babbitt face). Figure 12 is a plan view of the same operating condition for forward rotation. The isotherms are important in that they show if there is edge or skew loading from misalignment, which can distort comparisons and lead to erroneous conclusions. The symmetric patterns of Figs. 10 through 12 indicate good axial alignment between the loaded pad and shaft, attributed to the alignment capability of the rolling contact pivot design. A study of pad surface isotherms indicated that the pads were aligned with the shaft and that peak temperatures were located along the circumferential centerline for all operating conditions tested. This then assures that the centerline pad temperature profiles can be used as an accurate indication of the maximum pad temperatures. In viewing the isotherms, it is noticed that the maximum temperature location is closer to the center of the pad in the case of reverse rotation, compared to the forward case where the maximum temperature is close to the trailing edge. Another observation is that there is a substantial axial temperature gradient, especially in the case of reverse rotation. The temperature drops 40◦C from the center hot spot to the sides of the pad for the operating conditions shown, suggesting a severe level of thermal distortion. Figure 13 compares isotherm centerline temperatures for forward and reverse rotation at 62 m ·s−1, 2.2 MPa. The isotherm centerline temperatures were generated by a polynomial fit of the loaded pad measured centerline temperatures. Data for a center pivot bearing from a prior paper (Brockwell, et al. (5)) are interposed for comparison, and all are plotted in the same direction of rotation. The location of the maximum temperature derived from the fit is noticed to move closer towards the center of the pad as the pivot offset is reduced. The maximum temperature occurs at a location 90 percent of the pad angle for the forward rotation offset pivot, 82 percent for the center pivot design, and 68 percent for the offset pivot in reverse rotation for the operating condition indicated. A similar analysis was performed for each of the test operating conditions. The maximum temperature location was found to vary mostly with load and slightly with speed for the operating conditions presented in this paper. The data are plotted in Fig. 14. The maximum temperature location moves towards the center of the pad with increasing load, from the 100 to the 88 percent location in the case of forward rotation and from the 76 to the 64 percent location in the case of reverse rotation. The maximum temperatures obtained from the isotherm curve fits were no more than 2◦C above the maximum measured temperatures for the cases tested, so Fig. 9 can be used as a reasonable representation of the associated temperatures at Fig. 14 locations. The pad surfaces were examined after the tests and found to be in excellent condition, with no wipes or any indications of distress. 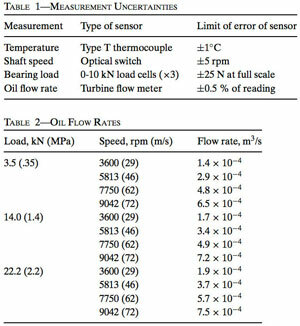 This proves that the offset pivot bearing can run in reverse without damage, although the high pad temperatures suggest limitations. While a detailed analysis on limitations is beyond the scope of this paper, the authors believe the subject warrants some discussion. The array of detectors in these laboratory tests makes it possible to determine the maximum pad temperature. This seems a straightforward parameter to assess limitations except that distress does not necessarily occur at this location. The 75 percent location is often cited as the critical position for temperature detectors in field applications (Nicholas (8)) and is the recommended position in many industry specs. Other parameters need to be considered in assessing limitations. Three considerations are discussed in the following paragraphs in regard to reverse rotation in an offset bearing. These are babbitt integrity, oil film thickness, and lubricant integrity. A comparison of oil film pressures and temperatures with the babbitt yield point is a method that can be used to assess babbitt integrity (DeCamillo and Brockwell (4)). Figure 15 contains yield point data from specification ASTM B-23 Grade 2. Calculated oil film pressures used in this discussion are obtained from a computer program described in detail in a separate paper (Dmochowski, et al.(1)). The intention here is not to evaluate the material criteria or computer code, but to provide information for the discussion regarding babbitt integrity. Figure 16, then, is a plot of calculated oil film pressure and test isotherm centerline temperatures for test conditions of forward rotation at 72 m ·s−1, 2.2 MPa. It is noticeable in Fig. 16 that the pressure is lower at the maximum temperature location, and the temperature is lower at the maximum pressure location. By comparing each location’s pressure to the yield point, one can determine that oil film pressure is closest to yield at the 75 percent location in Fig. 16. At this location, the oil film pressure is 9 MPa at 100◦C compared to a 21 MPa yield point from Fig. 15, and so there is a healthy margin of safety regarding babbitt integrity. Figure 17 is a plot of the same operating conditions for reverse rotation. In this case, the temperature at the 75 percent location is high at 132◦C but the pressure is only 1.0 MPa. The critical area is found at the 45 percent location where the film pressure is 13 MPa at 125◦C. Referring to Fig. 15, the corresponding yield point is 14 MPa, which indicates there is little margin of safety for Fig. 17 operating conditions. It is interesting to note that the substantial drop in reverse rotation trailing edge temperature (Fig. 17) correlates well with the cavitated pressure zone between 80 and 100 percent of the pad arc length. Cavitation is a plausible explanation for the pronounced trailing edge temperature drop and also influences the reverse rotation pad equilibrium position. In other words, the pad is behaving somewhat like a center pivot pad of shortened arc length. Minimum oil film thickness is another design criterion of importance for reliable bearing operation. The babbitt can be scratched and damaged over time by debris if the oil film is smaller than the filter mesh. If the film gets too small, high points of the surfaces can come in contact that can cause excessive heat and wipes. Film thickness was not recorded in the course of the tests. The smallest calculated minimum film thickness for the test conditions of this paper is .012 mm at 29 m ·s−1, 2.2 MPa in reverse rotation. It is desirable in many applications to limit pad temperatures to 93◦C. This is more in regard to oil integrity. Oil life is shortened at higher temperatures, and deposits can form on the pad surfaces, causing temperature problems over time. If the reverse rotation is due to adverse, temporary conditions, the oil can withstand the higher temperatures without causing bearing failure. The maximum temperature recorded for the reported conditions is 136◦C in reverse rotation at 72 m ·s−1, 2.2 MPa. Pad temperature is the basic measurement available in the field. Unlike the heavy array of instrumentation afforded in test facilities, field applications have only one or two detectors located towards the trailing edge of the pad for the normal direction of rotation. A complication is added in the case of reverse rotation because the detector is then on the leading edge, measuring a cooler temperature as indicated by example in Fig. 18. Here, the “field detector” would only record a 100◦C temperature in reverse rotation while the maximum temperature is actually 126◦C. To help in this situation, Fig. 19 plots the difference between the “field detector” location and the maximum measured temperature for reverse rotation for the test conditions reported in this paper. For example, the maximum pad temperature at 62 m ·s−1, 2.2 MPa in reverse rotation was 25◦C higher than measured at the “field detector” location. Test have been performed on a 152.4-mm diameter, flooded lubricated, 60 percent offset pivoted shoe journal bearing in forward and reverse rotation for LOP orientation. Key conclusions arising from these tests are as follows: The offset pivot bearing ran in reverse rotation without damage, although pad temperatures were high. Pad surfaces examined after tests found no indications of distress after the test operating conditions specified in this report. Pad temperatures increase in the direction of rotation to a maximum for both forward and reverse rotation operation before falling to cooler levels towards the trailing edge. Reverse rotation maximum measured temperatures ran 1 to 27◦C hotter than forward rotation maximum temperatures over the range of conditions tested. The reverse rotation maximum temperatures reached 136◦C compared to 109◦C for forward rotation at the most extreme conditions. The maximum temperature location is further from the trailing edge of the pad in the case of reverse rotation, compared to the forward case where the maximum temperature is close to the trailing edge. There is a substantial axial temperature gradient, especially in the case of reverse rotation. The maximum temperature location varied more with load than speed, moving towards the center of the pad with increasing load from the 100 to the 88 percent location in the case of forward rotation, and from the 76 to the 64 percent location in the case of reverse rotation. The test bearing ran with a calculated minimum film thickness as low as .012 mm at 29 m ·s−1, 2.2 MPa in reverse rotation with no indications of distress. The test bearing ran with maximum temperatures of 136◦C in reverse rotation at 72 m ·s−1, 2.2 MPa with no indications of distress, although an assessment of babbitt strength indicates there is little margin of safety at these operating conditions. The temperature at the typical “field detector” location would register 110◦C at these conditions. The authors are grateful to Kingsbury, Inc. and the National Research Council of Canada for permission to publish the results of this study. The authors also wish to express their deepest appreciation to Keith Brockwell for his devotion, commitment, and contributions to the field of tribology. Without his efforts, this work would not have been possible. Scan DeCamillo, Member, STLE, Kingsbury, Inc.
(1) Dmochowski, W., Brockwell, K., DeCamillo, S. and Mikula, A. (1993), “A Study of the Thermal Characteristics of the Leading Edge Groove and Conventional Tilting Pad Bearings,”ASME Journal of Tribology, 115, pp 219-226. (2) Bouchoule, C., Fillon, M., Nicolas, D. and Barresi, F. (1995), “Thermal Effects in Hydrodynamic Journal Bearings of Speed Increasing and Reduction Gearboxes,” Proceedings of the 24th Turbomachinery Symposium, Texas A&M University, pp 85-95. (3) Simmons, J. and Lawrence, C. (1996), “Performance Experiments with a 200 mm, Offset Pivot Journal Pad Bearing,” STLE Tribology Transactions, 39, pp 969-973. (4) DeCamillo, S. and Brockwell, K. (2001), “A Study of Parameters that Affect Pivoted Shoe Journal Bearing Performance in High-Speed Turbomachinery,” Proceedings of the 30th Turbomachinery Symposium, Texas A&M University, pp 9-22. (5) Brockwell, K., DeCamillo, S. and Dmochowski, W. (2001), “Measured Temperature Characteristics of 152 mm Diameter Pivoted Shoe Journal Bearings with Flooded Lubrication,” STLE Tribology Transactions, 44, pp 543-550. (6) Nicholas, J.C. (2003), “Tilting Pad Journal Bearings with Spray-Bar Blockers and By-Pass Cooling for High Speed, High Load Applications,” Proceedings of the 32nd Turbomachinery Symposium, Texas A&M University, pp 27-37. (7) Brockwell, K., Dmochowski, W. and DeCamillo, S. (2004), “An Investigation of the Steady-State Performance of a Pivoted Shoe Journal Bearing with ISO VG 32 and VG 68 Oils,” STLE Tribology Transactions, 47, pp 480-488. (8) Nicholas, J.C. (1994), “Tilting Pad Bearing Design,” Proceedings of the 23rd Turbomachinery Symposium, Texas A&M University, pp 179-194.